Adding an accept payments feature to your health and wellness software can have a massive impact on your software business’s profitability and client retention. There are few industries in the modern economy as consistently popular as health and wellness. As technology has improved and expanded with enormous new possibilities, software companies and platforms now cater to these businesses more often. Tech makes it easier for clients to synchronize and set up appointments, manage inventory, organize services and classes- the list goes on. There are, however, not as many software companies that grasp the opportunity of offering a more complete service, which includes payments. Catering to the health and wellness industry should also involve offering PayFac services. This can be particularly useful for gym or yoga memberships, wellness subscription businesses, as well as one-time services (think salons, chiropractors, massage & spa businesses). There are plenty of ways that becoming a payment facilitator (PayFac) can be extremely useful for these businesses, which is why it’s such a great opportunity for you to incorporate this into your online software platform. Providing software as a service is all about enabling convenience and speed for the end user. After all, if you’re in the health and wellness industry, you’re selling peace of mind. You don’t want your customers to be overburdened and stressed when trying to buy from you. 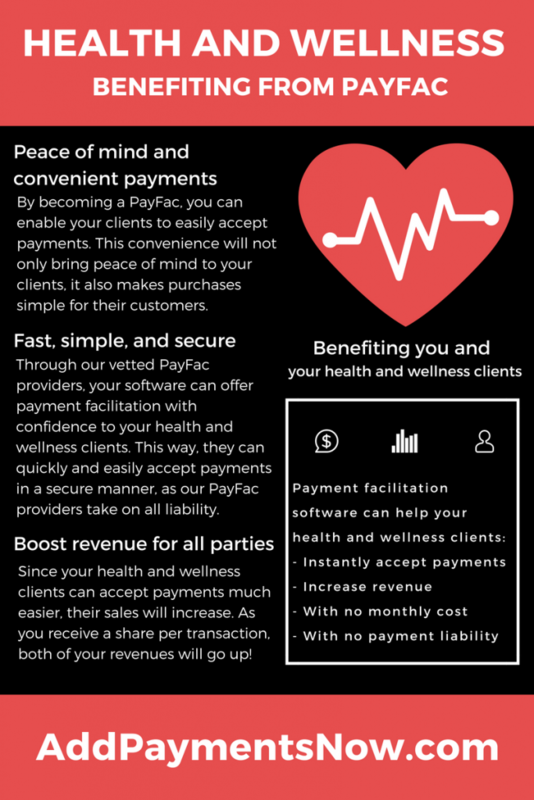 By including PayFac in the software you provide to various health and wellness businesses, you make it easy for your clients to have a simple way to accept credit card payments for appointments, memberships, and products. Through our vetted PayFac providers, we will be able to help you bring this new edge to your overall software platform. A benefit to your clients is that they can get up and running right away. Give them a fully functional payment feature to accept credit card payments for their wellness products and services. All through your software platform, at no significant monthly cost. The health and wellness industry is particularly focused on positivity, luxury, and comfort. Additionally, on the business side of things, they thrive on subscriptions and feel-good purchases. Gyms, spas, and various mindfulness clubs all gain greatly from a subscription model that their customers love. Depending on the individual business, subscriptions that your clients set up can be paid for on a per-use, weekly, or monthly basis – whatever is most convenient. Therefore, if you can provide them with the ability to integrate PayFac functionalities through the software they are already familiar with it will allow you to gain a tremendous competitive edge over other, less convenient, wellness software providers they might consider. We can help you add this accept payment feature for your clients. Whereas setting up payment processing used to be time-consuming, PayFac is exceptionally useful for quickly setting up the ability to accept credit card payments. In other words, without PayFac, your clients would need to find another way to accept payments. The traditional route would be through merchant accounts and payment gateways, which would usually be a complicated and lengthy process. Now, on the other hand, you will be able to set them up to process credit card payments practically immediately. Without extensive paperwork and through a software platform they are already familiar with. That is a great way to provide your clients and their customers with a feel-good, confident, and comfortable experience. Health and wellness businesses are usually brick-and-mortar, and they use software to synchronize and manage their business and appointments. Yet, many do not have a great way to process payments online. By incorporating PayFac into the software your clients already use, you enable online transactions for them in a familiar package. Salons, aestheticians, chiropractors, and massage parlors alike will suddenly be able to exponentially grow their potential customer base by now also selling their wellness and beauty products online. This added convenience will boost sales for your software clients. As you’ve been able to provide PayFac functionalities through your software, you will also increase your revenue as you will gain a share of each transaction. There is no doubt that peace of mind, convenience, and familiarity are at the center of the products and experience of health and wellness businesses. You can help them deliver their products with the same mantra in mind by adding PayFac capabilities to your software. We want to help you add this capability at no monthly cost for your software platform clients. With smooth, fast set-up and integration, you can add a new revenue funnel for both you and your clients. Contact us, we are more than happy to give guidance if you’re new to Payment Facilitation. If you’re ready to provide your clients with a seamless added service and want us to help pair you with a PayFac provider, get in touch, and we’ll get back to you as soon as possible!